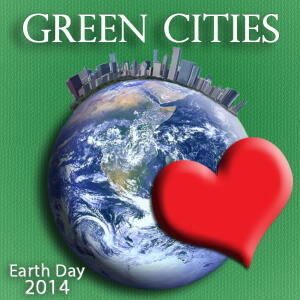 Cities Going Green for Earth Day 2014 - Planet Aid, Inc. This year’s Earth Day theme is Green Cities, an extension of the Green Cities Campaign launched in the fall of 2013 by the Earth Day Network. As of 2010, just over 50 percent of all people live in cities, and this number is expected to increase to 70 percent by the year 2050. With this population shift to concentrated areas comes the potential for major environmental consequences. The Green Cities campaign aims to help urban centers all over the globe reduce their carbon footprint and improve sustainability by focusing on three components: buildings, energy, and transportation. Buildings are responsible for one-third of all greenhouse gas emissions globally (and in the United States the percentage is even higher at 40 percent). We can ultimately reduce energy consumption in buildings by 30 to 80 percent, but not before we minimize red tape issues like building codes and city ordinances that make adopting green practices difficult and expensive. Energy sources nowadays are mostly fossil fuel power plants, which produce greenhouse gases and contribute to climate change. The Earth Day Network’s vision for the future is “smart grids,” which are localized, semi-autonomous microgrids that can distribute energy efficiently from wind turbines and solar panels. Transportation is the fastest-growing source of greenhouse gas emissions and accounts for 24 percent of global emissions. Tackling this problem will significantly help the environment, but it will also have positive residual effects. For example, investing in public transportation creates more jobs, and making cities more bike friendly and walkable promotes a healthier, cheaper alternative to get from point A to point B. The majority of people in developing nations live in rural areas. These countries have relatively small carbon footprints, and yet they have the most to lose from environmental degradation. They are dependent on their natural resources for economic growth, and they are more vulnerable to energy, food, water security, climate change and extreme weather risks. Consider that 98 percent of the 32.4 million displaced people in 2012 were forced to leave their homes because of climate- and weather-related events. Of those 32.4 million people, 96 percent were from developing countries. It seems then that the wisdom of the Green Cities Campaign goes beyond addressing urban growth. It is also embracing--intentionally or not--the social obligation cities have (as driving forces behind environmental degradation) to prevent the 70% of the world’s poor who happen to live in rural areas from disproportionally bearing the brunt of climate change. Every region of the Earth should be included in Earth Day, so let’s support green technology in both rural and urban communities as we celebrate our beautiful planet this month. Planet Aid is holding an Earth Day Art Contest, as well as participating in Earth Day events in Vermont, New Hampshire, Massachusetts, California, North Carolina, Pennsylvania, and Maryland. Check out our Local Planet Aid Pages to find out more.